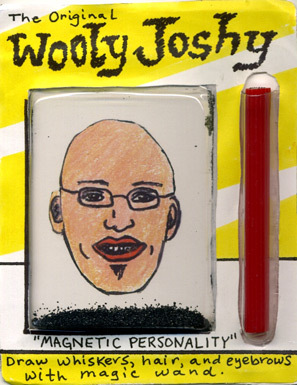 For my 27th birthday last month (almost exactly one month ago, actually) Steph made cool little party favors, one of which was a “Wooly Joshy.” I wanted to write about it then, but didn’t have time. Now I’ve got a tiny bit of time (mostly because I’m deciding that I do), so here’s a picture of one! Enjoy. Awesome! We need a flash version so we can play with it online. I’d make Josh a unibrow and long stringy ear hair, then I’d give him whiskers and a curly-Q, then… the fun is endless. It’s addicting. Now I just can’t stop. It’s become too excessive, to the point that when I look at you I try to picture different hair styles and what kind of beard you could have. You can’t stop me! Darn you Wooly Josh! Why isn’t the soul patch optional? Have you ever seen me without any sort of beard?!? Yes, and you look cute as a button! But I keep visualizing and think you should attempt the Fu Manchu. If you do i will buy you some chaps. If he gets the Fu Manchu, I’m requiring him to watch Kung Fu and other martial arts movies so he can at least get the demeanor down, even if he couldn’t kick to save his life. Heh.